This test kit, manufactured/assembled by Tracklink, has been designed specifically for SWTH 3B functional testers (a specific grade of railway signalling engineer). It is designed to apply failure feeds and strap or function testing. The kit comes complete with probes which have been designed for this specific use. 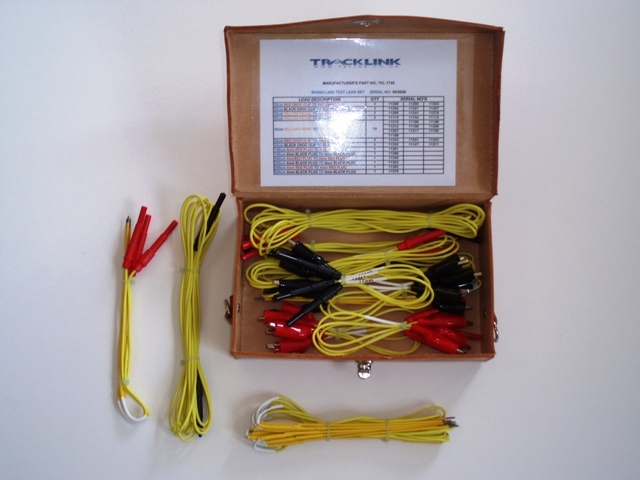 Engineers can use this kit to influence signals when on location carrying out specific tests. The leads in this test kit each have a unique serial number, as well as the whole kit itself. Tracklink advise that after use, ALL leads are checked against the contents card, which has the serial numbers printed, to avoid any leads being left connected in the back of relays. For further details on this bespoke piece of testing equipment, call us on 01428 685124 or email enquiries@tklink.co.uk.